The global market for 8K TVs is expected to post weaker-than-expected growth this year amid a lack of available high-resolution content, market watchers said Monday. 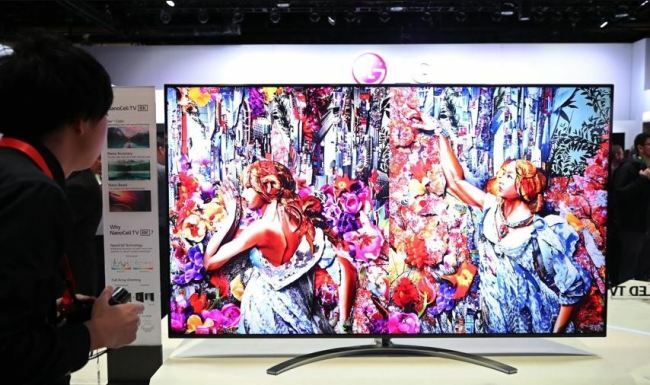 South Korean tech giants Samsung Electronics Co. and LG Electronics Inc. boasted their 8K TVs with quadruple the pixels of Ultra HD models in the Consumer Electronics Show earlier this month, promoting them as new growth drivers in the premium segment. Despite the technological advances, industry watchers point out that the 8K market still remains in its infancy due to a lack of content for the standard and steep price tags. According to the data compiled by industry tracker IHS Markit, the global shipments of 8K models, such as organic light-emitting diode and quantum dot, is expected to reach 338,000 units this year, down from 430,000 anticipated in October. It also lowered its 2018 sales estimate from 18,100 units to 12,500, which is set to be released later. Industry watchers pointed out that next-generation TVs are forecast to slowly expand their market share in the short term because there is a lack of video content that can fully take advantage of the screen resolution on 8K displays.